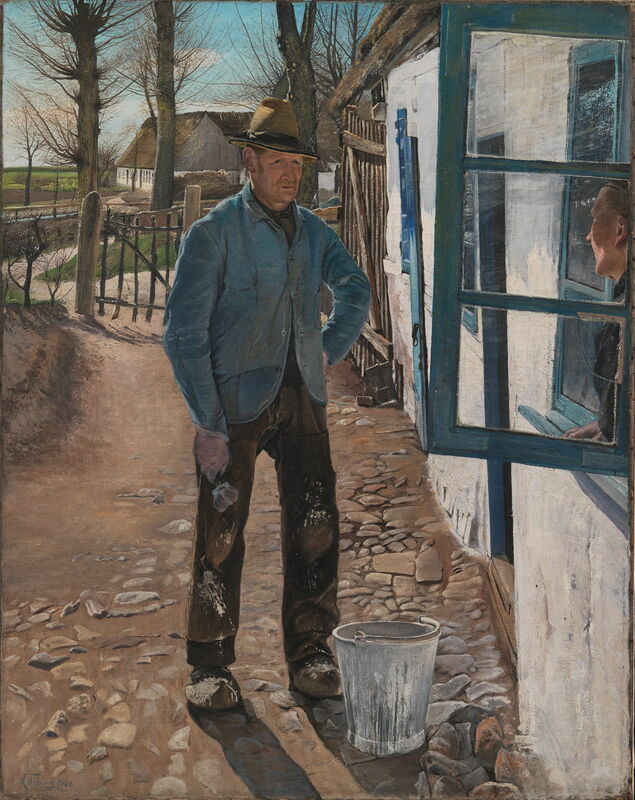 Over the last few weeks, I have looked at the careers and works of two great Danish realist painters in parallel: Hans Andersen Brendekilde (1857–1942) and Laurits Andersen Ring (1854–1933). In this final article, I’d like to draw together some conclusions about their paintings, illustrated by some of the finest work. They shared the surname of Andersen, only changing later when they came to exhibit together. Both came from humble rural families, and together had to struggle long and hard to achieve recognition for their art. They shared political ideas, being socialist, with Ring even something of a revolutionary when a young man. 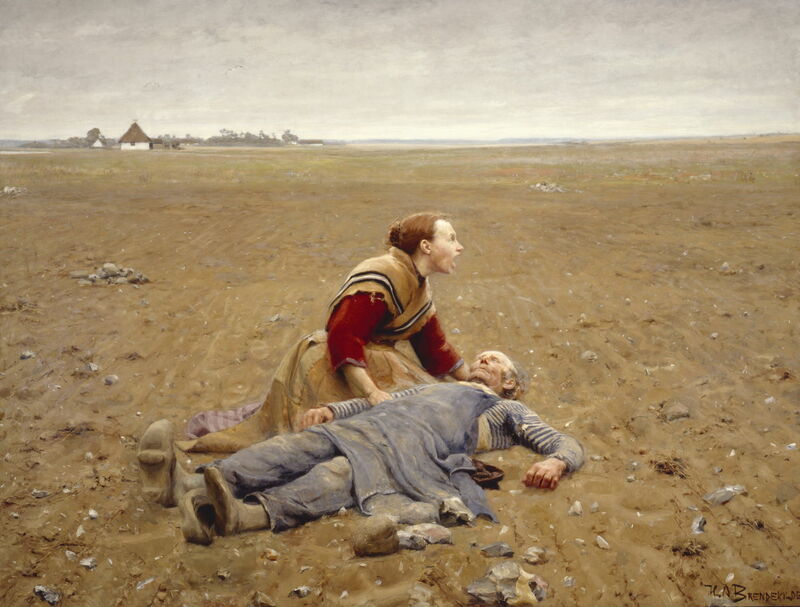 Soon after they had changed their names to enable their viewers to distinguish them, Brendekilde captured Ring’s frustrations in L A Ring by his Fallen Easel (1883). Ring was even contemplating emigrating to America. Laurits Andersen Ring (1854–1933), The Lineman (1884), oil on canvas, 57 x 45.5 cm, Nationalmuseum, Stockholm, Sweden. Image by Erik Cornelius, via Wikimedia Commons. For Ring, recognition came with The Lineman in the summer of 1884. Hardly radical or even social realist, it did though express the spirit of that time of great change in the country, and for such ordinary people, without sentimentality, or even for that matter showing the plight of many in rural areas. It was Brendekilde’s Cowed in 1887 which tackled some of those issues more openly, but even here they only surface with careful reading. 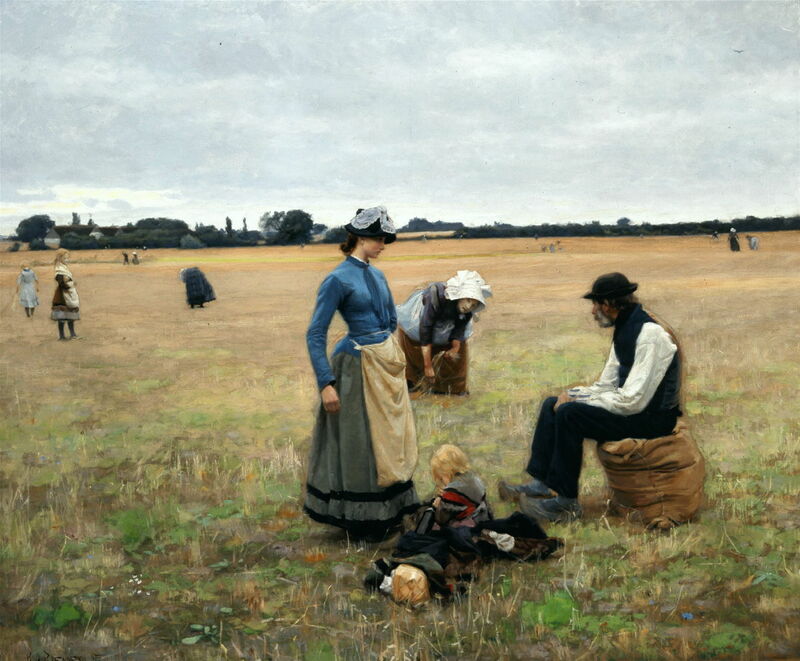 His style is reminiscent of Jules Breton or Jules Bastien-Lepage, and the subject the rural poor gleaning after the harvest. The family group in front of us consists of three generations: mother is still hard at work gleaning her handful of corn; her husband is taking a short break, sitting on the sack in his large blue wooden clogs; their daughter is engaged in a serious conversation with her father, as her young child plays on the ground. The daughter is ‘in service’ as a maid in a rich household in the nearby town. She is an unmarried mother, abandoned by her young child’s father, and it is she who is oppressed or cowed by her circumstances. Brendekilde followed this in 1889 with his remarkable Worn Out, which surely stands alongside the best of Jules Bastien-Lepage. 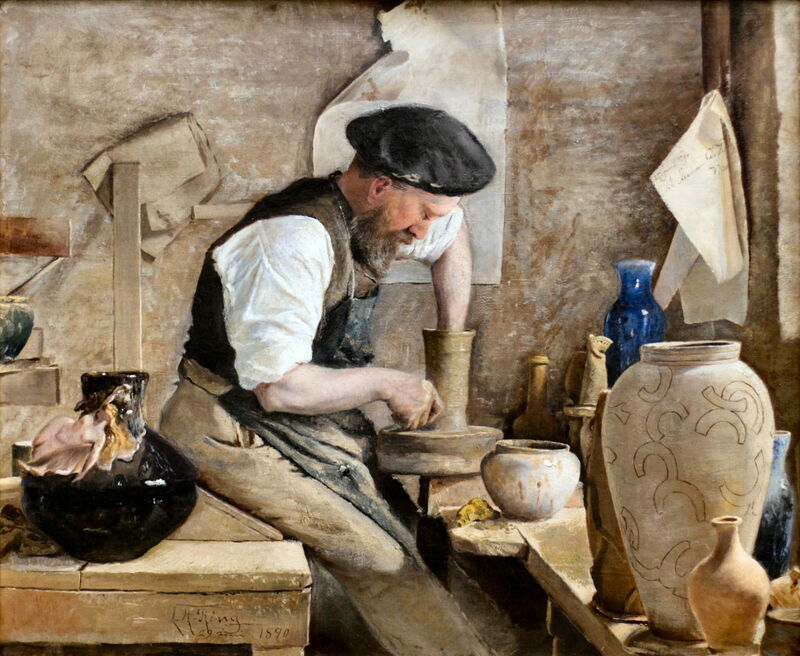 Ring pursued a unique project which documents skilled workers in their humble working environments, among them his future father-in-law, the ceramic designer and potter Herman Kähler in his Workshop (1890). However, these are almost documentary in their style, not a call to action. 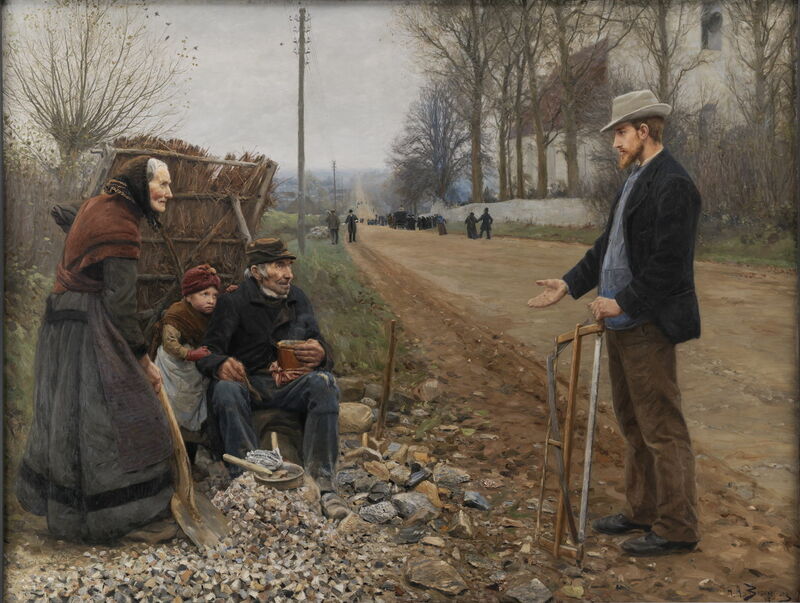 Brendekilde’s road paintings, particularly his People by a Road from 1893, seem to have been his last social realist works. In this, a young carpenter (with references to Jesus Christ) is preaching to a family of itinerant stone-breakers. Laurits Andersen Ring (1854–1933), At the French Windows. 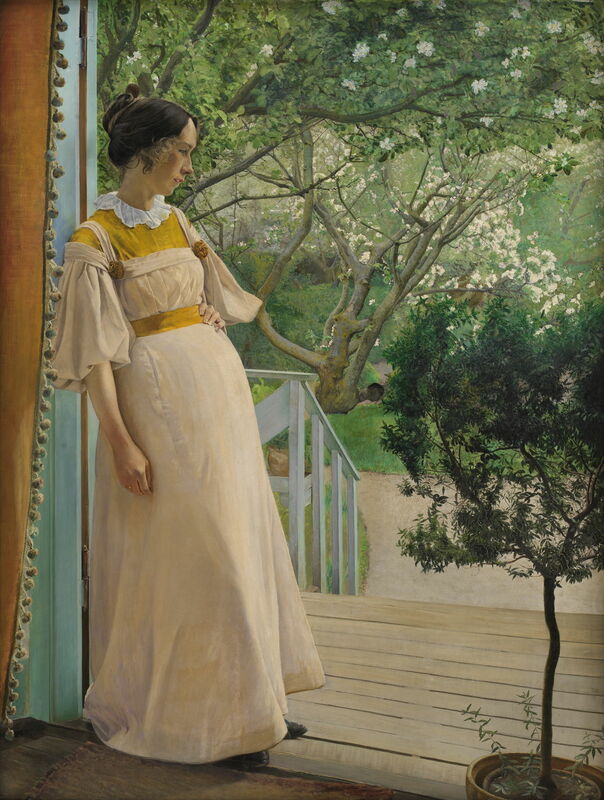 The Artist’s Wife (1897), oil on canvas, 191 x 144 cm, Statens Museum for Kunst (Den Kongelige Malerisamling), Copenhagen, Denmark. Wikimedia Commons. Ring won a bronze medal at the 1900 Exposition Universelle with this wonderful full-length portrait, At the French Windows. The Artist’s Wife (1897), which marked his transition to mature and thoroughly respectable painting. 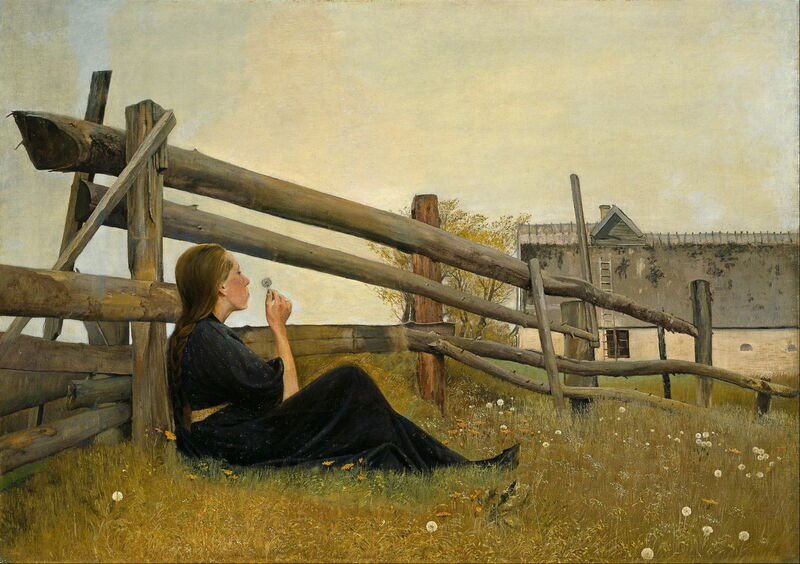 Laurits Andersen Ring (1854–1933), In the Month of June (1899), oil on canvas, 88 x 123.5 cm, Nasjonalgalleriet, Oslo, Norway. Wikimedia Commons. The following year, Ring painted another outstanding work, In the Month of June (1899), in which his wife sits blowing dandelion ‘clocks’ in a moment of dolce far niente, as his social realism fell away altogether into the Aesthetic. 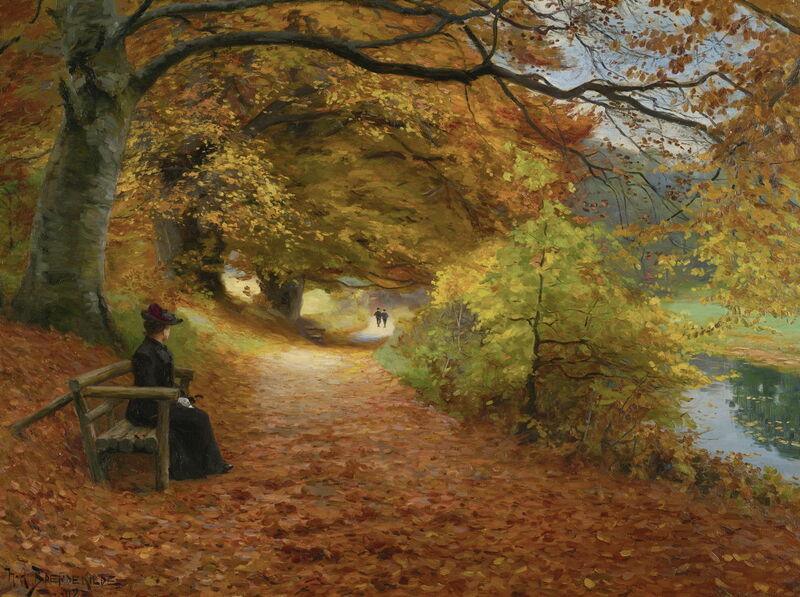 There was still narrative to be found reading Brendekilde’s paintings, such as his Wooded Path in Autumn from 1902. Here, it is more speculative and open-ended, like a ‘problem picture’ within its rich autumn landscape. Laurits Andersen Ring (1854–1933), Whitewashing the Old House (1908), oil on canvas, 122 x 96 cm, Statens Museum for Kunst (Den Kongelige Malerisamling), Copenhagen, Denmark. Wikimedia Commons. Ring’s working men remained detached and unemotive, as in Whitewashing the Old House from 1908. Then just before the First World War, the two friends painted a common motif drawn straight from Millet’s The Sower of 1850, one of the archetypal works of social realism. 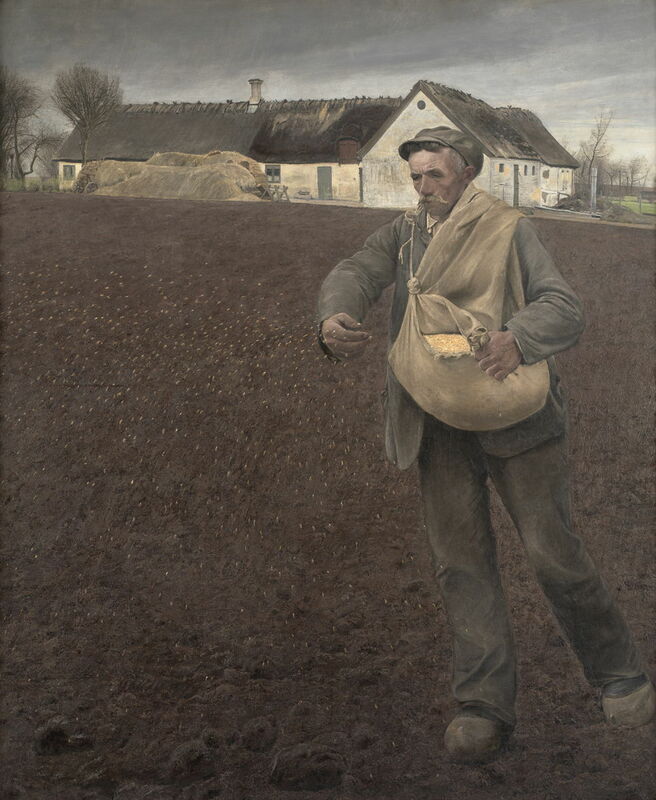 Laurits Andersen Ring (1854–1933), The Sower (1910), oil on canvas, 186.5 x 155.5 cm, Statens Museum for Kunst (Den Kongelige Malerisamling), Copenhagen, Denmark. Wikimedia Commons. Ring’s Sower from 1910 is innovative not for its style or social content, but its photographic freeze-frame of the seeds caught in mid-air. 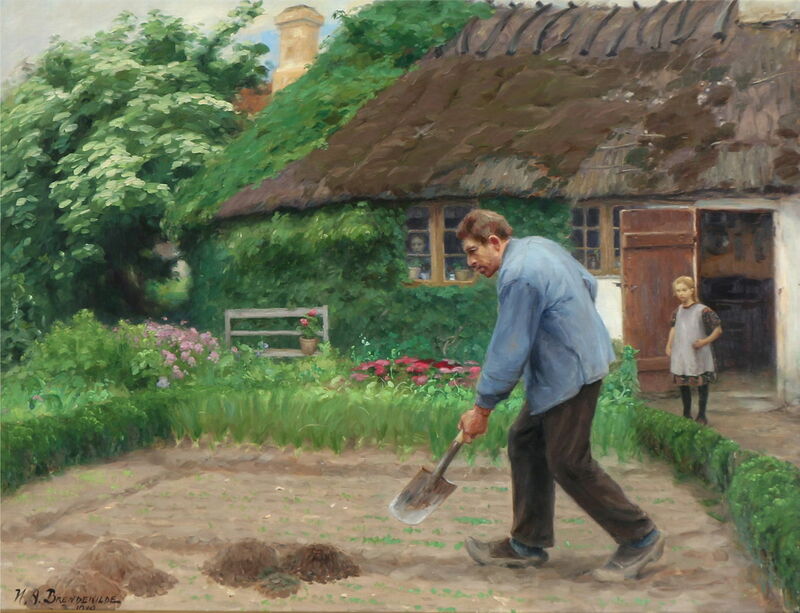 Four years later, Brendekilde set his sower as a small part of the countryside where he had been born, in A Sower on a Sunny Spring Day at Brendekilde Church (1914). It’s almost idyllically pastoral, not social comment except for the abundant flints in the soil. 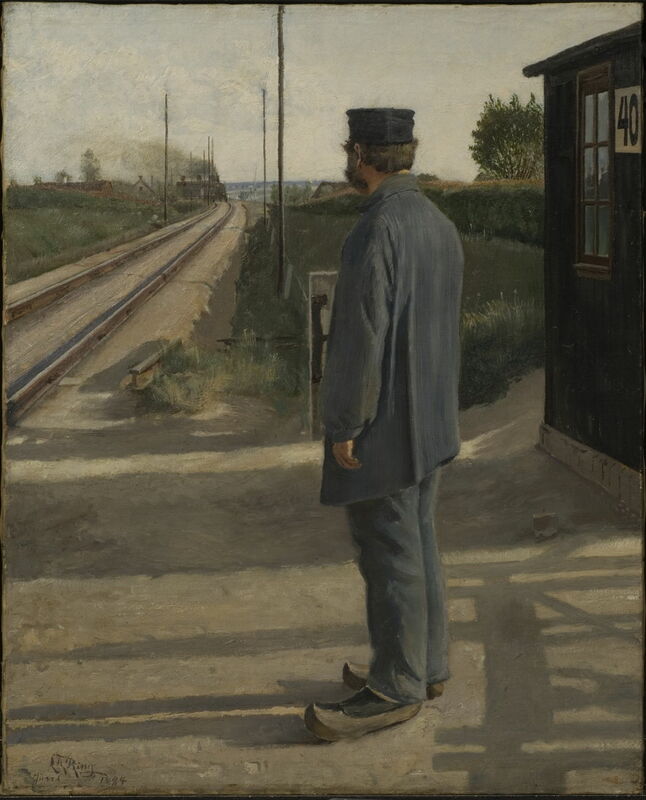 Laurits Andersen Ring (1854–1933), Waiting for the Train. 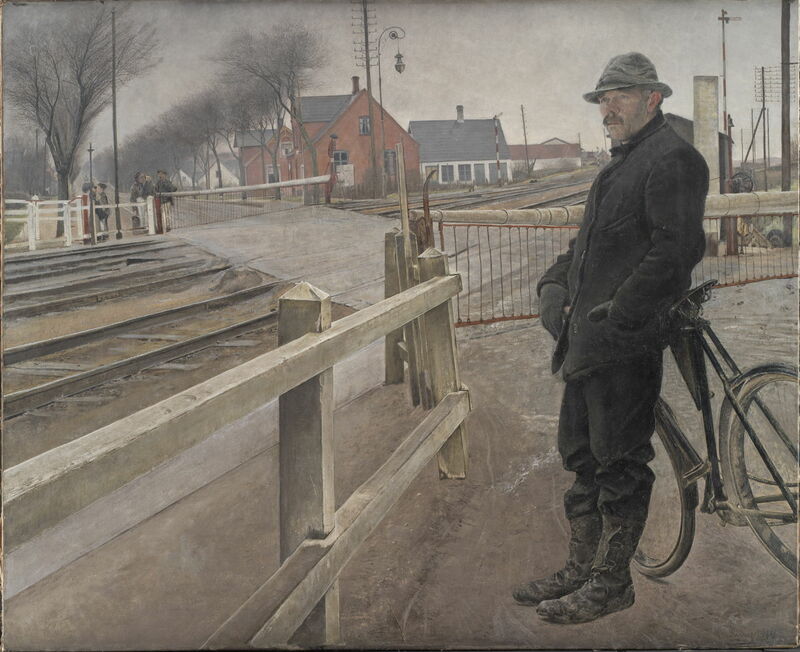 Level Crossing by Roskilde Highway (1914), oil on canvas, 142.8 x 174.5 cm, Statens Museum for Kunst (Den Kongelige Malerisamling), Copenhagen, Denmark. Wikimedia Commons. That year, Ring revisited The Lineman (1884) of exactly thirty years before in Waiting for the Train. Level Crossing by Roskilde Highway (1914). It is equally matter-of-fact and almost mundane in its lack of emotion. 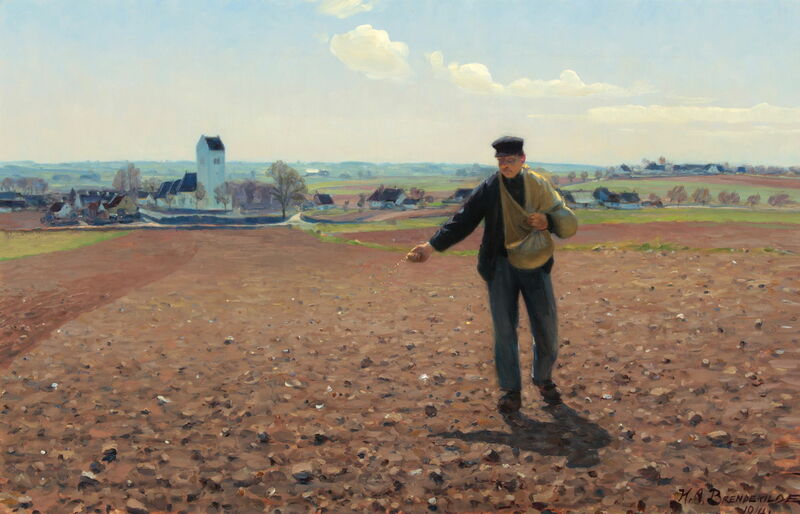 Both artists seem to have retired at a similar time: Brendekilde to paint the occasional pretty but rather bland rural scene, and Ring to paint landscape views from his retirement home just outside Roskilde. 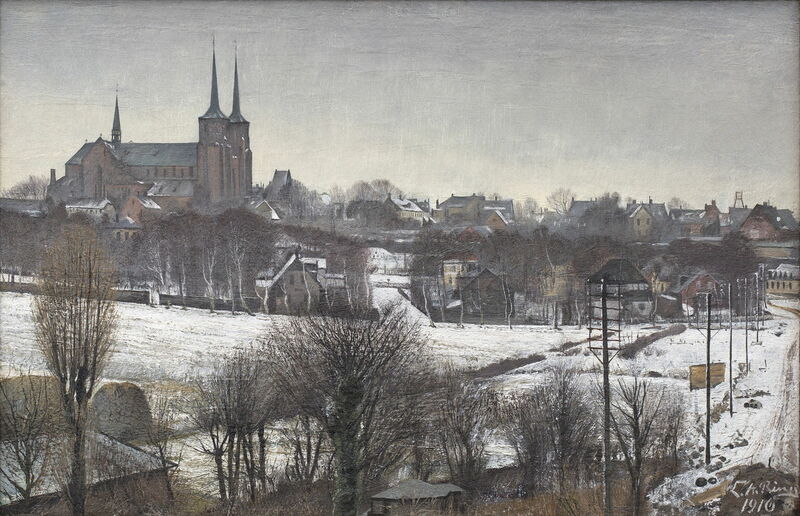 Ring’s superb View of Roskilde from Sankt Jørgensbjerg from 1916 has a fine rhythmic texture which extends deep to the skyline, and is a tribute to his skill and technique. Hans Andersen Brendekilde (1857–1942), Afternoon Work (1918), oil on canvas, 77 x 100 cm, Private collection. Wikimedia Commons. Brendekilde’s delightful garden tale in Afternoon Work (1918) shows the whimsical battle between a dedicated gardener and the mole steadily burrowing under his vegetable patch. I suppose most of us are the same. The fire of our youth turns to the cozier warmth of later life. 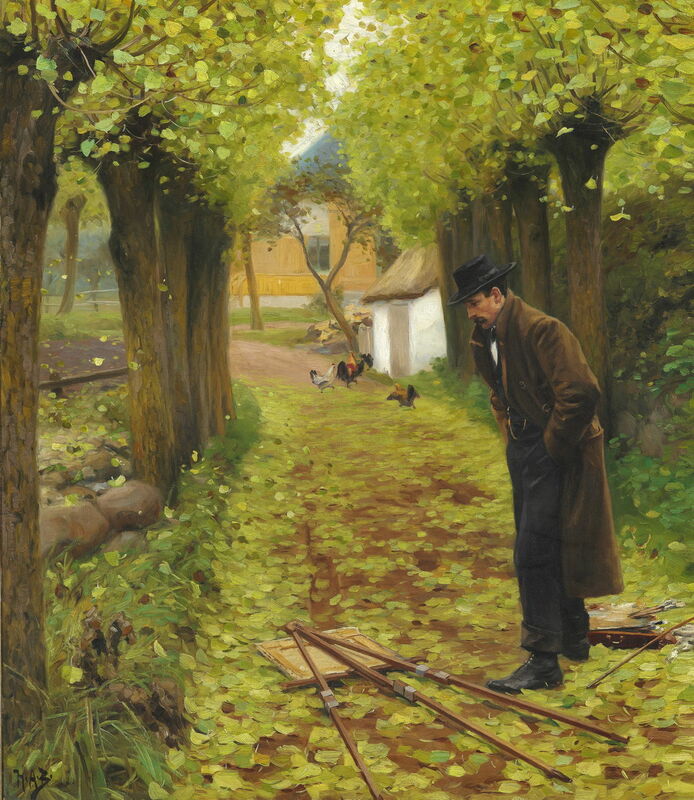 Posted in General, Life, Painting and tagged Andersen, Brendekilde, Denmark, naturalism, painting, realism, Ring. Bookmark the permalink.